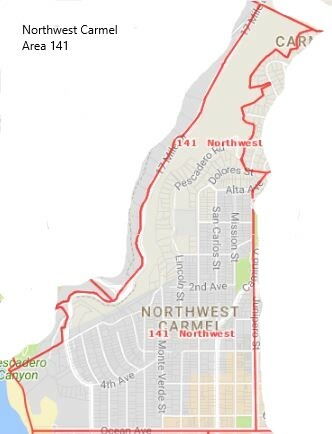 The Northwest Carmel home region stretches bascially to the intersection of Serra and Dolores, straight down Junipero to Ocean Street and over to the ocean. In this MLS area 141, you'll find lovely homes with hilly terrain and fitlered ocean views. To the far west, in the southern section, you'll find smaller estates and a few places that are actually on the sand in Carmel. Being on the sand in Carmel is a rather rare property that doesn't come up often, and certainly is a pretty penny and ocean view.Carmel homes with a sand access to the beach are desirable for the beach lover.